According to its ad, today’s Nice Price or Crack Pipe Porsche 911 has had “thousands in upgrades.” Some of those are under the radar—including a radar detector—but could they all add up to you seeing fit to pay its asking price? This week’s forecast called for two days of rusty Toyotas followed by a period of high pressure. Yesterday we had one of those rusty Toys—a 1983 Toyota Corolla wagon with a 4A-GE engine under its hood. It also had rolled fenders, cut springs, and a think patina that spoke eloquently of its almost 350K in mileage. All that still couldn’t overcome a reasonably low price and a sassy attitude (just look at that dyno report!) and in the end it came away with a 63% Nice Price win, the second for our pair of rusty ‘80s Asians. Okay, now that we’ve had our fill of holy rollers, let’s look at something a little more intact. Here we have a 2000 Porsche 911 in ebony over black and grey leather, and it’s not your run of the mill 996 either. This one comes with “thousands in upgrades” one of which is supercharger with a water to air intercooler. That’s on top of the 3.4-litre water-cooled six which in its pre-blower days made a respectable 296-bhp. Here with five pounds of fun, it most probably makes some more. As a matter of fact 129 more, for a total of 425-bhp according to this listing. The work on the mill is claimed to have been professionally committed—done by a shop called Speedriven in Paletine, IL. A six-speed manual puts those ponies to the pavement through the back wheels alone so driving the car should be entertaining for the experienced, or possibly life-threatening for the wealthy unskilled. Other changes making up those thousands in upgrades include a body kit estimating a GT3 look, Bilstein coilovers, aftermarket wheels, Continental tires, and a custom cluster in the lower dash that includes both boost and A/F mixture gauges. The car looks to be in fine shape and unlike Wednesday’s crazy mileage turbo, this one rocks just 50K on the clock. An Alpine stereo dresses up the 996 dash, and in fact the entire interior looks to be a pretty nice place to conduct business. The shop selling the car has done an admirable job of cleaning it too, even getting those wonderful little vacuuming triangles that we all love at hotels in the carpet on the door bottoms and around the central tunnel. Outside, the paint holds its shine without issue and the fried eggs are clear and clean. They still make you look like you’re driving a Boxster however, if that makes any difference to you. There doesn’t seem to be any major negative to this car, unless that is you take issue with any of the “thousands in upgrades” that have been applied. This being a 996—the least loved of all 911 models owing to its close visual relationship to the lessor Boxster and their rep for the engine’s intermediate shaft failures—maybe it’s the model to buy? At this point I don’t think many people care if the 996 looks like the Boxster, and if the engine in this car hasn’t been retrofitted by Porsche by this time, then that’s just crazy. Still, it’s something to ask. Another thing to ask is how much, and I have the answer to that. 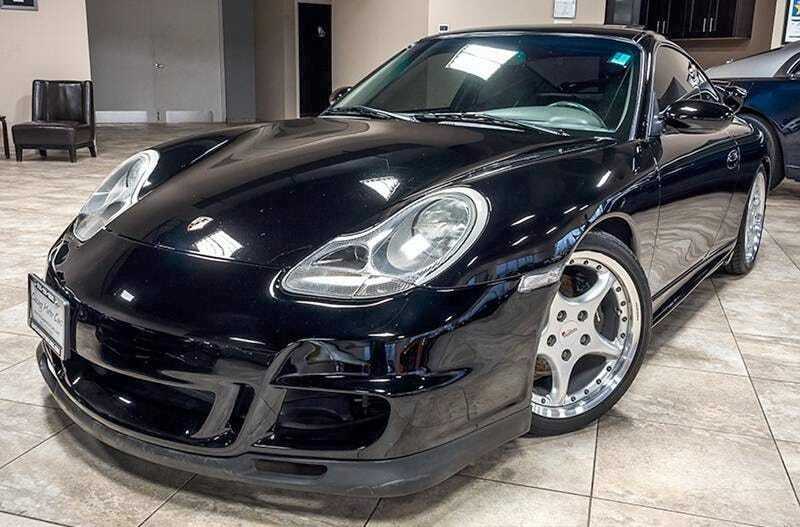 This supercharged 996 with the cool carpet patterns is asking $27,800, and it’s now incumbent upon you to decide if that’s a deal or not. What do you think, is this blown 911 worth blowing up your bank account? Or, is this a Porsche priced to repulse? eBay out of Chicago IL, or go here if the ad disappears. H/T to adamgdeaton for the hookup! \Help me out with NPOCP. Click here to send a me a fixed-price tip, and remember to include your Kinja handle. For $3,000, Could This 4AGE-Imbued 1983 Corolla Wagon Tempt Your Wallet?